Does the US know what it’s doing in the South China Sea? The idea that the US may send military aircraft and ships to assert freedom of navigation around Chinese claimed islands in the South China Sea is seriously bad. It’s bad because it would involve an unreasonably assertive interpretation of the international law of the sea, and because it shows such little regard for the impact of such action on regional stability. There are three main implications of the US proposal that concern the law of the sea. The first is the status of China’s claims to the disputed islands. A recent authoritative report from the Center for Naval Analyses in Washington concluded that while Vietnam may have a better claim to both the Spratlys and the Paracels, ‘[a]t the same time, U.S. policymakers cannot lose sight of the fact that China’s claims may be superior’, and that ‘[t]he absence of an unambiguous legal case in any of these disputes reinforces the wisdom of the U.S. policy of not taking a position regarding which country’s sovereignty claim is superior.’ The action now being contemplated can only be seen as an indication that in fact the US has taken a position on the sovereignty claims. The second issue is the oft-stated line from Washington that China threatens the freedom of navigation in the South China Sea. But what freedoms of navigation are being threatened? China has always said that with freedoms of navigation and overflight, it only disputes the right of the US to conduct military activities, particularly certain types of intelligence collection and military data gathering (so-called ‘military surveys’) in its exclusive economic zone (EEZ). China’s disputation of the right of the US to undertake these activities isn’t without merit, particularly when the military surveys constitute marine scientific research which is under the jurisdiction of the coastal State in its EEZ. Also, it’s significant that several other regional countries, India, Malaysia and Thailand, share China’s position on military activities in the EEZ. Washington then aggravates the situation by referring to the waters of the South China Sea as ‘international waters’, ignoring the reality that these waters are actually the EEZs of the bordering countries, including China. It also ignores the fact that the high seas freedoms of navigation and overflight available to other countries in these waters shall be exercised with what UNCLOS calls ‘due regard’ to the rights and duties of the relevant coastal State. The freedoms of navigation being claimed by the US in the South China Sea aren’t absolute and have to be exercised with ‘due regard’ to the rights of coastal States. For the US now to be claiming them appears as though it’s ignoring the sui generis nature of the EEZ established by UNCLOS. For all these reasons, the action contemplated by the US looks like a dangerously unilateral assertion of rights by Washington. What’s even more worrying is that the US, as a non-party to UNCLOS, may be ignoring some of the convention’s carefully balanced outcomes between the rights of coastal States and those of major maritime powers. In even contemplating such an assertion of rights in the South China Sea, it appears the US has given little consideration to the impact on regional stability. Provoking China in such an aggressive and unnecessary manner can only make the current situation worse. One wonders whether the US knows what it’s doing in the South China Sea. Is it propping up its treaty partner, the Philippines, or is it asserting its own interests vis-à-vis those of China? Does it know its own limitations when it comes to following through on it its actions? Is it thinking of the consequences? Does it have any idea of an endgame in the South China Sea? These are all vexed questions the answers to which are far from clear. What does all this mean for Australia? Basically, it means we should keep well clear of what the US is contemplating, including joining Washington in these protests against China. This article first appeared in The Strategist. 5 Responses to Does the US know what it’s doing in the South China Sea? Clearly the US is playing the role of an outside destabilizing force. Good informative article. Asians put great stock in saving face; the US leadership put great stock in having two faces. Like Putin said, via Lavrov, we’re had enough. The whole world has had enough of the US leadership. That includes the treasonous Congress and Senate. Looking forward to the time when the US government is broke and the leadership entitlement paychecks bounce. And their paid for security is gone. There was no navigation close to the islands that are being capped with dredging. The water was too shallow. 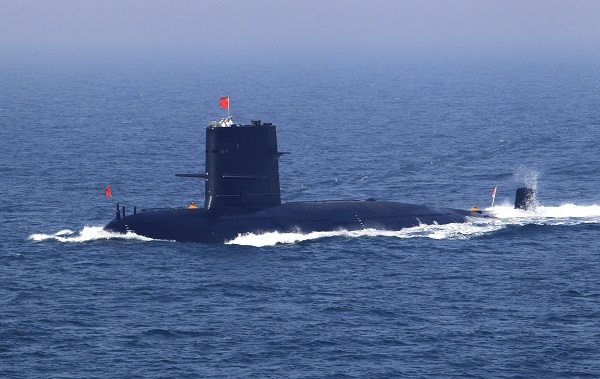 China is making havens that will allow some deep water anchorage in case of an emergency. Part of the work is to dredge harbours and channels. Having people and equipment on these islands will afford greater maritime safety than there is at presence. China is doing all the hard work in building these islands. Building islands and extending coastlines with landfill and dredging is not new and happens all around the world. Kooragang Island in Newcastle area is an example. No other country has ‘tested the water’ by building their own island in this contested area, maybe they should build one rather than complaining. Aircraft carriers seem to be a military substitute for an island however they only have one purpose. At least the Chinese are not killing indigenous indians to take over the land, they re just building it. The problem people seem to have is that they are not recognising these islands as parts of China. That argument needs to be negotiated and settled. This has been an excellent strategical move by China. Control of the Diaoyu/Senkaku Islands gifted control of all traffic to and from the South China Sea, which is the only reason the U.S. was interested in them, in connection with their ‘Asia-Pacific Pivot’ aspect of their rabid international expansionist programme. ‘Protecting the rights of ‘Frenznallies’ was the usual rationale proffered. By going beyond that, and establishing the presence on the Spratlys, China has almost completely negated that. China has no interest in limiting traffic, or even rights, of other littoral nations. China is merely following very traditional self defence strategies. It has always preferred a system of being surrounded by buffer States. When one of those is threatened or invaded, it comes down, throws the miscreant out, then always retreats back behind its own borders again. China is in the throes of creating its first military base outside its own borders right now, in Djibouti. The U.S. has almost 900, with special forces in 143 countries. Militant expansionism is simply not the Chinese way. Some of the U.S.-dominated media reporting on this issue has been beyond intellectually insulting. There have been reports of artillery emplacements on the islands, for example. Missiles, I could understand, the DF-21 would be an excellent choice here, but artillery? Artillery is for plains warfare: what are they going to be shooting at on an island? Thank you Commodore. This is the first article I have read that sensibly speaks of international maritime law vis a vis the South China Sea and US incursions into this zone. Dr Sam Bateman retired from the Royal Australian Navy as a Commodore and is now a Professorial Research Fellow at the Australian National Centre for Ocean Resources and Security (ANCORS) at the University of Wollongong in Australia, and a Senior Fellow in the Maritime Security Programme at the S. Rajaratnam School of International Studies (RSIS) at the Nanyang Technological University in Singapore.